With the launch of any new social media platform comes great hesitation – especially from bloggers. The thought of learning “one more” new thing for your blog can be harrowing. There’s already so much to keep up with, and so, choices must be made. Periscope recently was added to the social media mix and is seeing quick adoption from online personalities looking to connect with readers authentically, and in real time. But is it really worth jumping on the bandwagon? There definitely are some things to take in to consideration before making the move to the app, but overall it’s an exciting way to up your blogging game, grow your community, and show yourself as an early adapter of blogger-friendly technology. For those new to Periscope, let’s do a quick breakdown of how it works. The concept really is simple. You broadcast a live video anytime, anywhere from your phone. To get started, just download the app. After launching Periscope, you should integrate the app with your Twitter handle. The app is owned by Twitter, so the two work hand-in-hand, especially in helping get exposure to grow your audience. Once you’re logged in, go to the camera icon at the bottom of the screen. Your first visit here will allow you to enable your camera, microphone, and location. After granting permission for all three, you’re ready to stream. You can adjust all of your scope features – title, location, privacy, chat, and Twitter posting – conveniently from stream to stream, depending on the type of scope video you want to create. For example, you can expand your audience by making your scope available to everyone. You also can offer an exclusive look to select followers by choosing to do an invite-only scope instead. For more specifics, see my in-depth Periscope 101 post on how to broadcast street journalism from your phone. Scopes are quick and digestible. “Readers like videos because visual storytelling can be quickly absorbed and is incredibly relatable. This has created a demand for effective, authentic video content,” says Hollatz. Scopes are a great way to get through to your readers in a quick and easy way that (if done well) will keep them coming back for more, time and again. They are live and uncut. Authenticity is a key factor in building your network, and it doesn’t get any more real than this. “Getting to know the real blogger behind the brand has never been easier or more important,” says Hollatz. With Periscope, you can really show your audience who you are, with a glimpse of what it’s like to hang with you in person. It’s a time saver – in so many ways. Not only does Periscope eliminate the hassle that usually comes with creating video content (we’re talking no frills here, and no editing), it’s a venue for immediate feedback from your audience. It’s an instantly connective platform to grow your network. The give-and-take format of a live audience breeds creativity, while also positioning you — the centerpiece of the video — as an expert and leader. Hollatz uses Periscope to advise her followers on community building, while building her own community in the process. She pairs scope videos with her weekly Twitter chat, #createlounge. “It all integrates together nicely,” she says. One broadcast can be repurposed across multiple platforms. Broadcast replays vanish from Periscope after 24 hours. To allow your content to live online longer, adjust your settings to autosave all videos to your camera roll for repurposing later. This allows for quick upload to YouTube, Facebook, or your blog. Another option is to add the #katch hashtag to your title before starting your broadcast. It’s an easy hack that will extend the shelf-life of your scope online. Before truly diving in, do a quick soul search for your blog. Ask yourself: “Is my audience even interested in this platform?” You want to make sure they’ll show up before making the commitment. Otherwise, you could opting to do more work without a concrete payoff in sight. Make sure your idea is scope-worthy. Bloggers know better than most the shrinking attention span of online audiences. Because of this, it’s critical to find new ways to keep your audience in the palm of your hand with attention-grabbing content. “A scope-worthy broadcast is one that has the perfect blend of actionable tips and personal experience. If you can be transparent, passionate, creative, and authentic in your delivery, you’re well on your way to making a big splash,” says Hollatz. Create an outline and rehearse it once or twice. 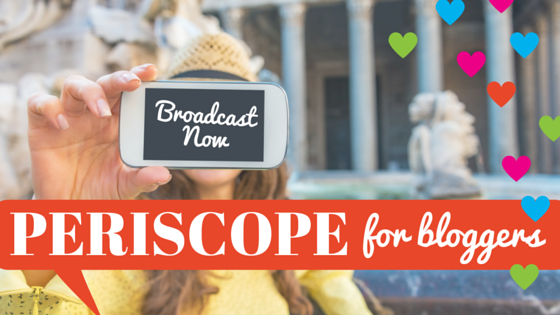 “What I hear most from bloggers who haven’t jumped on Periscope yet is that their nerves keep them from broadcasting. As an introvert, I get it,” says Hollatz. To help your first broadcasts go smoothly, Hollatz suggests writing talking points on notecards to help you stay focused. This also provides you with a point of reference if you draw a blank. She also recommends trying out a private scope with a close friend so that you can live and learn the features together, like flipping the camera view and responding to comments. But, don’t be afraid to be spontaneous. As mentioned before, authenticity is such a critical part of growing your audience. No one wants to see you locked up in robot form. Human moments are endearing and relatable, so don’t be afraid to break away from your outline to relax, have fun, and be yourself. Stabilize your phone. Not everyone has a steady hand or is good at multitasking. For a smoother video, a tripod for your phone could be a wise (and affordable) investment. A selfie stick also can help you get a wider array of shots and angles. As far as orientation, Periscope recently integrated landscape video mode. Decide which orientation is best for your video and where you want to house it before you start, so you won’t be distracted by setup. Dress the part. There are plenty of bloggers out there going the #NoMakeup route on Periscope. But, that can be an intimidating approach when you’re broadcasting a video to anyone who wants to watch. Confidence is key to eliciting trust. Dressing up a little can give you the boost you need to own that power position so your audience takes you seriously. Create captivating titles. Give your stream a title that’s relevant to your scope and audience. The title should be captivating, search friendly, and include smart hashtags. You want to compel your audience to click now and also make it easy for people to find later. 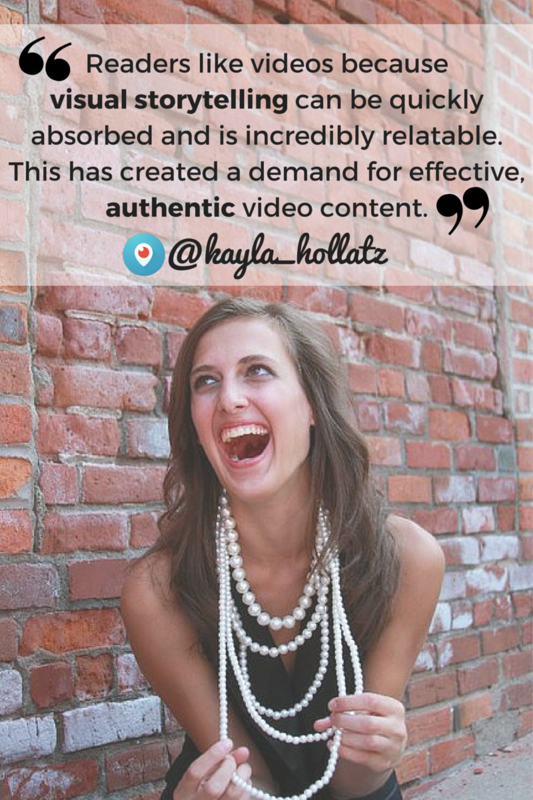 (Tip: Check out @Kayla_Hollatz’s Periscope tweets for some great examples). Promote your scope ahead of broadcast. Prior to your scope, there are a couple things you’ll want to do. First, alert your social media audience. A countdown tweet in the hours before and again in the minutes before can help draw viewers. Second, before you broadcast, be sure that the Twitter post feature is on, so that your followers are notified to tune in. Now, you’re ready to broadcast like a pro. If you’re still feeling unsure about jumping in, go secure your name – even if you don’t plan on using it right away. Then, you’re there with your desired name when ready. In the meantime, you can follow others and participate in their broadcasts. Relationships are built even if you don’t hit “start broadcast” yourself. Stay up to date on media trends and best practices. Subscribe to Beyond Bylines to receive posts by email. Or if you’re looking for supporting information and statements for breaking news stories, sign up for public interest news via PR Newswire for Journalists – your one-stop shop for newsgathering with access to custom newsfeeds, ProfNet experts and our multimedia gallery. Sign up at prnmedia.prnewswire.com or contact us to learn more.